Taiwan’s Information and Communications Technology (ICT) companies form a key part of the global ICT ecosystem. Taiwanese companies hold huge market shares in semiconductors, PCs, mobile devices, broadband appliances and display products and technologies. The ICT industry today is evolving at an unprecedented pace, as we enter into the era of Industry 4.0. Governments around the world are adopting measures to prepare their economies for the ongoing transformation. Taiwan is no exception. Taiwan recently launched its Digital Nation and Innovative Economic Development Plan (2017-2025), known as “DIGI+”. One of the plan’s main goals is to grow Taiwan’s digital economy to NT$6.5 trillion (US$205.9 billion) by 2025. The component strategies focus on infrastructure, talent, cross-industry transformation, digital rights, smart cities and boosting aiwan’s standing in the global digital service economy. OpenGov conducted a joint email interview with Mr. Francis Liang Kuo-Hsin, Representative, Taipei Representative Office1 and Dr. Chiueh Tzi-Cker, Vice President & General Director, Industrial Technology Research Institute of Taiwan2 (ITRI) to learn about the envisaged future for Taiwan’s ICT industry. Could you please provide an overview of the landscape of Taiwan’s ICT industry, including large corporates, SMEs and startups? The Information & Communications Technology (ICT) sector has always been Taiwan’s source of pride. Over the last four decades, Taiwan has been highly regarded as a vital player and major procurement centre for global ICT companies and buyers. Taiwan’s advanced research and manufacturing capabilities in semiconductors, PCs, mobile devices, broadband appliances, and cutting-edge displays, has made the country the world’s biggest supplier of these products. The industrial clusters of electronics companies in Taiwan offer clear cost and time-to-market advantages, making Taiwan an excellent one-stop shop for procurement, design support, and rapid commercialisation of product ideas. Many of Taiwan’s biggest brands are tapping this manufacturing expertise to offer consumers innovative products and better value. With the emergence of the Internet-of-Things (IoT) and smart technologies, Taiwan is now gearing towards shifting from high tech manufacturing to an intellectual property and innovation-driven economy. Through the Asia.Silicon Valley Initiative, our government is positioning Taiwan as the regional link that connects Asia to Silicon Valley players, as well as a global hub for tech entrepreneurs. According to the latest official statistics report from the Ministry of Economic Affairs, R.O.C, the number of companies in Taiwan is 1,416,738 including 32,757 large corporations (2.31%) and 1,383,981 SMEs (97.69%). Taiwanese startups totaled 98,320. The numbers are as of end 2015. The report underscores the importance of ICT industry in Taiwan as its gross production amounted USD92,300 million, contributing 16.5% of the total GDP in Taiwan. What are your views on the prospects for Taiwan’s ICT industry going forward? What are the priorities and major challenges? Part of Taiwan’s strategic priorities to build a sustainable economy includes investment in industrial innovation, as summed up in Taiwan’s “5+2 Industrial Innovation” plan. The 5+2 refers to the seven vital sectors of Taiwan’s economy: biotech and pharmaceuticals, green energy, national defense, smart machinery, and the IoT, as well as the ‘circular economy’ and agricultural development. The concept of ‘circular economy’ was adopted by Taiwan from the Netherlands and is based on principles of restoration and regeneration, aiming to keep products, components, and materials at their highest utility and value. Overall, Taiwan’s key aims are to spur innovation, enhance employment and income distribution, and bring a more balanced regional development for Taiwan across different sectors. Under the pillar for IoT is a flagship program called the Asia Silicon Valley Development Plan, which aims to establish Taiwan as the hub between the Asia region and Silicon Valley, particularly in IoT development, and for making the country a global center for tech entrepreneurship. The plan supports Taiwan’s goals of increasing its global IoT market share from 3.8% in 2015 to 5% in 2025, which according to Gartner’s projections could be worth US $11 trillion by 2025. Taiwan has made inroads with Microsoft and Qualcomm who have chosen to establish their IoT research centres in Taiwan. There are also over 140 organisations that have joined the Asia.Silicon Valley IoT Alliance with a goal to further advance the industry. As part of Taiwan’s national strategy to develop an intellectual property (IP) and innovation-driven economy, the country developed and implemented the Taiwan Industry Image Enhancement Project (IEP), which aims to enhance the image of Taiwanese brands and help them expand their business internationally. One of the recently concluded projects under IEP is Taiwan Excellence’s inaugural participation at CommunicAsia 2017, an annual enterprise technology conference and exhibition organised in Singapore. 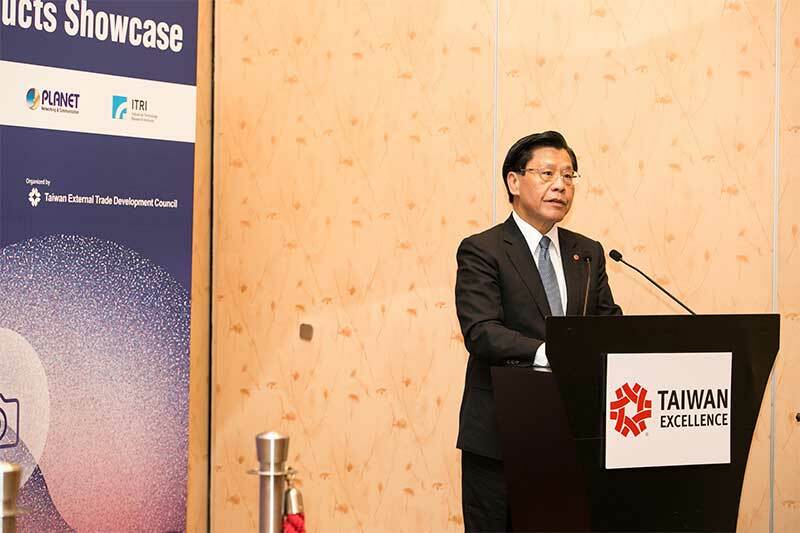 Through the Taiwan External Trade Development Council (TAITRA), Taiwan brought for the first time the Taiwan Excellence brand to CommunicAsia creating an opportunity for Taiwanese companies to break into the Southeast Asian market and providing members of the regional ICT industry to interact with cutting-edge technologies and innovations from leading Taiwanese companies like Acer, Advantech, ASUS, Planet and VIVOTEK, among others. One of the major challenges that Taiwan faces today is the shortage of talent. As such, Taiwanese ICT companies need to put greater attention to attracting and retaining talent within the industry. Furthermore, with the re-industrialisation in Europe and North America and the rise of China as a manufacturing power, there is an urgent need for industrial transformation to remain competitive. Are there any specific areas in technology that are expected to drive growth? Can you share some developments in emerging technologies such as AI, data analytics, and IoT etc.? Emerging technologies in areas such as artificial intelligence, robotics, IoT, are expected to drive growth in today’s Industry 4.0 era. For instance, automated guided vehicles (AGVs) and autonomous drones will help increase productivity and reduce manpower reliance for industries across logistics, manufacturing, and retail. The ITRI has introduced several exciting, state-of-the-art technologies including an intelligent vision system for companion robots, and a remotely operated autonomous drone. In addition, ITRI has also just released a smart pesticide detector featuring micro optical inspection, which was awarded the COMPUTEX 2017 Best Choice Award. In Taiwan and in Asia, ITRI is promoting the NSOS or next-generation system software for smartphone technology. NSOS is designed to increase the added value of commodity Android phones. Some features of this project include: solving the BYOD security problem via smartphone virtualization; providing more personalised services via accurate inference of dynamic user interests; and offering more streamlined smartphone usage experiences via programmatic app control by leveraging on the capabilities of existing apps. Specifically, the smartphone virtualisation technology enables a physical smartphone to be used as multiple virtual smartphones, e.g., one for office use (more secure and less secure), another for personal use (more flexible but less secure), and the third for app trial (risky but free). This way, a smartphone user only needs to carry one physical device, and then uses it in different ways in different contexts, without interfering one another. Taiwan is well-known for its high-tech manufacturing industries. Ms. Audrey Tang, Taiwan’s Digital Minister, said in an SCMP article that “it is unhealthy to emphasise on any one industry.” What is being done to promote interaction and collaboration across different industries within Taiwan? It is important for industry leaders to realise the importance of cross-industry collaboration. This will help create a synergy when companies exchange ideas and views with their counterparts in other industries. In 2016, Taiwan launched the Digital Nation and Innovative Economic Development Plan (2017-2025) known as “DIGI+”. One of the highlights of this program includes spurring cross-industry digital innovation. This includes utilising a digital innovation ecosystem that features integrated hardware and software capabilities to increase cross-industry cooperation; helping industries develop innovative applications of digital technology, and enhancing enterprise-level digital operations that accelerate the transformation and improvement of domestic industries. With these actions, the digital economy will continue to develop and expand. What are the expected implications of the Digital Nation Plan for Taiwan’s ICT industry? According to a report from G20 Insights, one of the key challenges within the ICT industry is the lack of digital infrastructure and services. With Taiwan’s Digital Nation Plan, the government will be working with telecom providers to ensure that broadband made available to all its citizens. Also dubbed DIGI+, the 8-year Digital Nation Plan was launched this year to reinvigorate and expand Taiwan’s digital economy. Its goals are to increase Internet bandwidth, bridge the digital divide between urban and rural areas, and raise Taiwan’s position to the top 10 spots in the global information sector. The strategic plan is also aimed at helping the country attain a digital economy valued at NT$6.5 trillion (US$205.9 billion). In sync with the growing trend around the world for IoT, the enhancement of digital infrastructure will help boost the ICT industry and in turn, help improve the nation’s GDP and further propel it into the digital age. This March the government announced a NT$46.056 billion (US$1.51 billion) over the next eight years to improve the nation’s digital infrastructure and bridge the rural-urban divide. Can you tell us about the involvement of the ICT industry in that, as an enabler or beneficiary? Taiwan’s Internet penetration rate in 2015 was 84.8 percent. With the rise of the IoT in the recent years, more devices will be connected and this highlights an urgent need for the government to make efforts providing Internet access for its citizens and businesses to keep up with the global trend and ensure its relevance in the increasingly competitive business landscape. This will make the ICT sector a crucial enabler for Taiwan’s push for a digital nation. The ICT industry will also play an increasingly imperative role in transforming people’s lives, and improving efficiency for businesses, education, and the government. How is the Taiwan government dealing with the regulatory aspects of new technologies such as fintech and what is their impact on the industry? Fintech, currently on its nascent stage in Taiwan, is a sector with high growth potential. We recognise the massive opportunity in fintech as confirmed by financial industry observers. Emerging financial technologies such as blockchain represent a tremendous opportunity to enhance secure and efficient sharing of information across Taiwan’s financial conglomerates. To set the stage right for the flourishing fintech sector, Taiwanese government has made considerable investment to establish dedicated organisations and funding schemes to develop and implement plans to boost fintech development. For example, the Fintech Office under the Taiwan Financial Supervisory Commission (FSC), regulator for security markets, banking and insurance sector, has been established to develop and implement strategies that are geared towards the digitalisation of the financial environment, mobile payment, third party payment, Internet financing or peer-to-peer lending, online investment, and IoT, among others. Last year, the government also launched FintechBase, an initiative aimed to assist the accelerator FinTech Development Foundation with investments in startups as well as courses and international accelerator resources and services. The accelerator raised NT$200 million (US$6.4 million) in 2016 from banks, brokerages, insurance associations and other financial institutions during its first fundraising effort. On top of said initiatives, Taiwanese regulators have made it a top priority to put in place risk management measures and to promote fintech development in compliance with international regulations. The Taiwanese government aims to protect the finance industry and consumers and prevent online finance crimes and other risks. Through said protective measures, Taiwan seeks to maintain Taiwan’s attractiveness as a destination for foreign investment. This year itself, 2017, the FSC is prioritising the implementation of a “regulatory sandbox” that will enable both financial institutions and fintech developers to test new products and services for a trial period of up to nine months without the constraints of regulations that typically will apply to the financial sector. How is the Taiwanese government working with tech startups and SMEs to build an ecosystem where innovation can thrive? In Taiwan, more than 97% of enterprises are SMEs and about 100,000 new companies are founded every year. The Taiwanese government has also realised the importance of this growing and vibrant startup community that is set to transform a number of industries within the country. HeadStart will do this through three key steps: deregulation, investment from global funds, and building startup clusters. To further help these startups venture into the global market, the Taiwan Startup Stadium (TSS) was also launched in 2015. The TSS is a hub that coaches Taiwanese startups to venture into the global markets through intensive programs, strong leadership, and a broad network of global partners. Additionally, the recently launched Digital Nation Plan also included the building of a licensed communications system packed with information that anyone, but especially high-tech startups, can use for their own development. These government initiatives provide a conducive incubating ground for startups, allowing them to “fail without incurring costs” and help promote an ecosystem for innovation, according to Ms. Audrey Tang, Taiwan’s Digital Minister. Gogoro, a game-changing electric scooter manufacturer created by HTC executives and drew more than US$150 million in venture capital from names like Cher Wang of HTC and Dr. Samuel Lin of Ruentex Group. Qsearch, a data analysis tool that allows enterprises more precision in Facebook ad targeting than native Facebook ads, is another promising startup developed by National Taiwan University graduate Elliot Chou. Qsearch could conceivably expand ad revenue for Facebook, as well as increase profits for advertisers all while taking a tidy cut of the bigger pie for itself. AirSig, focused on authentication and signatures for accounts and official documents, is another successful case study. Founded by Pokai Chen, a former Acer employee, AirSig is the first developer to intelligently address this problem with its algorithm and system for “signing” using the mobile device. The company has recently attracted international attention for its potential, but also has attracted serious venture capital from Taiwanese giant Foxconn. 1The Taipei Representative Office in Singapore is the Republic of China&apos;s (Taiwan) government representative office in Singapore. It is responsible for promoting Taiwan and Singapore&apos;s bilateral relations in the areas of the economy, trade, investment, the media, tourism, culture, education, and science and technology. 2Founded in 1973, ITRI is a nonprofit R&D organization engaging in applied research and technical services. ITRI has been dedicated to helping industries in Taiwan stay competitive and sustainable.